languagehat.com : Imagining Sanskrit Land. Approximately seven years ago, during an Internet search for information about these villages, I came across a clip on YouTube about a Sanskrit-speaking village called Jhiri. In this nationally syndicated news clip the presenter asserted that “almost all the people always converse in Sanskrit.” I found this phrase deeply ambiguous. I wanted to know more, and so, during April and May 2015, I spent four weeks in the village of Jhiri, where I faced exceptionally challenging conditions related to my health, the heat, and the fact that the village does not have electricity or running water. We stopped countless times at dusty, windy intersections to ask people if they knew how to get to the Sanskrit village. While many had heard of it, even people within the same group offered various potential locations and subsequent directions. On more than one occasion two people standing next to each other pointed in the opposite direction at the same time. The attitude of several Sanskrit speakers in Jhiri towards the hybridised Sanskrit they speak is that it ought to be purer. I heard the phrase atiśuddhaṃ bhaviṣyati (it will become more pure) on several occasions when discussing with the villagers the frequent mixing of Sanskrit with Hindi, Malvi, and English that I observed in the village. The community sees this as a sign of impurity that must be countered through the adoption of a purer, higher-register form of Sanskrit that is free of the perceived influence of other languages as well as of the camouflaged use of loan words. There’s an awful lot about yoga, but that’s understandable given that his work “focuses on various aspects of the transglobal yoga industry,” and if you’re not interested in that you can skim it, as did I. Thanks, JC! I’ve come across Indians on-line proudly claiming that Sanskrit is not a dead language as it is still spoken in some villages in India. Since “still spoken” implies unbroken transmission from ancient times, this is clearly a false claim and this article has put my mind at ease. Sanskrit is not “still” spoken in India. It has always seemed ridiculous to me to think that some remote villagers kept their language unchanged for 2500 years. If Sanskrit is anything like Latin, which is “still spoken” as a mother tongue by millions of people in the form of Italian, French, Spanish, etc., then it is possible to claim that Sanskrit is “still spoken” in the form of Hindi, Bengali, Punjabi, Marathi, Gujarati etc. As the article makes out, there is a deeply entrenched agenda in the claim that Sanskrit is “still spoken” today. There’s more at McCartney’s academia.edu site, e.g. Spoken Sanskrit in a Gujarat Ashram. However, given that it is “Vulgar Latin” still survives in the Romance languages and not Classical Latin, I wonder whether the same might not hold between Sanskrit and the modern Indian languages — perhaps it’s not as direct as I suspect. Someone here on LH may have a better idea. I’m not an expert, but, IIRC, the Sanskrit equivalent to Vulgar Latin is called Prakrit (and I’m not sure if that was a single language, the way Vulgar Latin apparently was, even way back then). @Bathrobe: From I gather, there seems to be more of a gulf between Sanskrit and the common ancestor of modern IA than between Classical and Vulgar Latin – with Sanskrit even having some notable innovations that modern IA lacks. I find this telling, as well as the fact that this is not an organic remnant of a Sanskrit-speaking population, but rather an attempt to artificially revive it as a spoken language. It sounds like another chore to add to the others requirements of subsistence. Interesting. Modern Indo-Aryan languages could be fairly enough described as descended from the language of the composers of the Vedas (via the various Prakrits); but strictly speaking, that language is not “Sanskrit”. The whole complex paraphernalia of Old Indo-Aryan verb flexion is avoided by paraphrasing with participles, with the occasional odd aorist form thrown in just to show off the author’s erudition. Pedants use it for obfuscation. Great poets (like Kalidasa) exploit the potential for complicated ambiguity and sheer exuberant variation that arise from the wild proliferation of compounding. Historically, Sanskrit was reserved for the elite: ancient legal text the Gautama Dharma Śāstra (12.4-6) proposes pouring molten tin and lac into the ears of non-twice-born (i.e. lower-caste) people who listen intentionally to a Vedic recitation that includes Sanskrit mantras; if they recite Vedic texts their tongue should be cut out, and if they remember or teach the mantras their body should be cut into pieces. In Sanskrit plays, only noble men and gods speak Sanskrit. The common people, children, and all females (even goddesses) speak one-or-another Prakrit. This was certainly a stylised convention (the Prakrits themselves were literary dead languages by this stage), but it presumably reflects a real prior state of affairs to some extent. One thing the article doesn’t explain is how exactly they learned the ancient language in such a backward, illiterate village. In early modern Europe, follies such as speaking Latin were a characteristic of the elites, noblemen and clergymen who had teachers/attended schools and could read. From here, it seems very odd that peasants would be determined enough to learn and start conversing in a dead language, however holy. Perhaps their ancestors were better off when this neo-Hindu movement started? I recall reading how surprised were Russian Sinologists to discover that completely illiterate elderly villagers in Manchuria often could quote long lines in Classical Chinese. Illiteracy can’t stop people from learning prestige language (or parts of it) if they were so inclined. They will find ways. it also does not really matter whether a Sanskrit-speaking rate of 0.033 per cent (20 out of 600 residents) makes it a Sanskrit-speaking village or not. Doesn’t matter to you, perhaps. This is the approximate time when speakers of Sanskrit began to adopt languages other than Sanskrit as their mother tongues. So far as the concept of language change over time has been adopted by the Hindutva crowd at all, it seems to be confined to the misconception that Sanskrit is the mother of all other Indoeuropean languages (if not all languages.) Apart from that, they seem to be working with a dynamic of pure/impure rather than ancient/modern. I haven’t had time to read the article, but I seem to remember from previous reading that these people belonged to a scheduled caste or tribe. I leave the socio-poltical implications hanging. Nonetheless, simply memorizing some old poems, prayers or even whole holy books isn’t quite the same as attempting to speak the thing pretty much all the time — this demands a considerable understanding of the grammar and considerable practice (with whom?) to begin. Otherwise it would probably result in a curious dialect of the local language sprinkled with Sanskrit words here and there. In Europe we had schools that drummed Latin into the pupils’ heads and the knowledge of (some) Latin was a marker of belonging to the elites so it self-reinforced, furthermore it gave you access to a large international literature. It’s not clear to me if those Sanskrit-speaking Hindus had any such tangible benefits. I seem to remember from previous reading that these people belonged to a scheduled caste or tribe. Most of Jhiri’s residents belong to the Sondhiya caste, which is a subcaste of the kṣatriya-jātī (warrior caste). It doesn’t figure in the list of scheduled castes for Madhya Pradesh either. Then I was wrong. Or maybe I heard of an other village. That means different socio-political implications to leave hanging. Well, no, he’s a yoga expert. But the number of people who have much understanding of linguistics as such is so tiny that if we waited for them to do all the tramping around trying to find backwoods communities, we’d be waiting a long time. But the number of people who have much understanding of linguistics as such is so tiny that if we waited for them to do all the tramping around trying to find backwoods communities, we’d be waiting a long time. Too true. I blame Chomsky. Missionary linguists still do tramp around trying to find backwoods communities, though (as they always have done.) Can’t see them being too welcome in a village so committed to Hinduism as to actually be trying to speak Sanskrit, though. The question of whether one should be profaning a holy language by using it for everyday purposes at all reminds me of some of the long-lost arguments against adopting Hebrew as the language of modern Israel; but there seems to be a different interpretation of linguistic holiness, at least among some proponents of Sanskrit on religious grounds: the use of Sanskrit in itself produces holiness. I wonder how ancient this idea actually is, given the fairly clear historical counter-tendency to restrict the use of Sanskrit to persons who are already superior? I know far too little about Hinduism to know whether there has always been some sort of dialectic about holiness going on within it, but I can think of parallels in other traditions fairly readily. On another tack, there have been attempts to revive Coptic as an everyday spoken language, and occasional somewhat breathless reports of limited success, but they all seem to melt away like mirages in the desert when approached too closely. Indeed, even the Vedic dialect was not directly ancestral to the modern Indo-Aryan languages, Some of the latter preserve conservative traits replaced by innovations in Vedic (and Classical Sanskrit). I wonder if there’s a village — perhaps somewhere in the Pontic steppes — where people still speak Proto-Indo-European. If so, are they already devolving into squabbling proto-dialects? I once came across a hoaxer on Reddit who was asking us to help identify the language of his ancestral village in the Caucasus (I think he said Georgia?) – the samples that he gave being unadulterated PIE in an ad hoc orthography. He also claimed that they practiced their own paganesque religion. I wondered whether he might truly be in some family cult, but my guess is that he was simply a fantasist. After reading D.H. Green, I read “holiness” as “divine favor, revealed through worldly power, especially through military victory.” But did you mean “holiness” as something else? I was thinking of “holy” in the much more basic sense of the (pre-Christian) Latin sacer “set apart for religious reasons; blessed; numinous; accursed.” The concept does not necessarily imply divine favour (or even the agency of any particular god), and need not even have any particular moral or ethical implications in itself. It does so, of course, for those participating in the cultures of Judaism, Christianity and Islam because that religious tradition intimately links religion and morality, to a degree where we readily make the quite false assumption that the link is a human universal. – the holy can sanctify the profane by contact. The idea that Sanskrit should be zealously safeguarded as appropriate only to a spiritual elite seems to belong to the first concept of holiness; the idea that using Sanskrit as an everyday matter could of itself lead to spiritual blessing seems to belong to the second. But as I say, I know too little of Hinduism to know if this is even a sensible comparison. Latin was used by people who had no other common tongue and who could converse if they chose, or at least by some who knew Latin. I will guess that since German philology came to dominate classics studies, the number of potential speakers has gone down further. Unless linguists have a different and particular definition, that isn’t really a dead language, just one with a restricted usage. It is full of neologisms, new definitions to old words, and new grammar, even today. The distinction between Vulgar and Classical Latin is not fundamentally temporal. They always coexisted, until Vulgar Latin had changed so much that it no longer made sense to talk of it as a single language at all. As time went by the spoken language changed, but there was no concept of natural change occurring spontaneously in language; that is a modern discovery. As far as the written language went, it was accordingly inevitably thought of as something intrinsically unchanging, and the increasing divergence between speech and writing was not interpreted as meaning that there was something off with the written language: for centuries any divergences from former usages introduced into writing from current speech were instead simply thought of as grammatical errors, and then as the divergence grew ever wider, eventually as meaning that an actually different language was in use for writing from that used in speaking. Even then people simply assumed that their forebears in classical times spoke Italian or Spanish or whatever but wrote in Latin, just as they themselves did. I don’t think anybody here is prejudiced against Vulgar Latin. Personally, I’m all for it. The Latin of mediaeval (and later) scholarship is not Vulgar Latin, though. It was intended to be Classical Latin by the writers. After the renaissance, the divergence between this relatively natural international language of mediaeval scholars, which had achieved an autonomous life of its own and had its own history and norms, and the language of the actual Classical authors came into clearer focus, and people started trying to write like Cicero instead of Duns Scotus and fretting about whether they’d got it right instead of just trying to convey meaning. The difficulty and artificiality of this project probably contributed to the doom of Latin-as-interlanguage. Thirty years ago I would have thought reviving Sanskrit is such a cool idea. Now I can’t help but think of it as another tool in the hands of toxic nationalists. One thing the article doesn’t explain is how exactly they learned the ancient language in such a backward, illiterate village. Zealot arrives, convinces enough people to join his quest for practical holiness, and has enough fervor left to teach people for free (well, in exchange for limited hospitality)? Illiteracy is irrelevant. Sanskrit isn’t Classical Latin, which has always been a written language first and foremost, and Hinduism isn’t Christianity which starts with texts that were composed in writing; writing was introduced to India after Classical Sanskrit had become classical, and the scriptures are traditionally memorized. there seems to be a different interpretation of linguistic holiness, at least among some proponents of Sanskrit on religious grounds: the use of Sanskrit in itself produces holiness. This view is presented at some length in the article. They do: a language is dead when it doesn’t have any native speakers anymore. and people started trying to write like Cicero instead of Duns Scotus and fretting about whether they’d got it right instead of just trying to convey meaning. The difficulty and artificiality of this project probably contributed to the doom of Latin-as-interlanguage. I doubt that. Linnaeus (mid-18th century) wrote letters in Latin that read like the work of a fluent speaker, not like a carefully constructed artifice. DM: a language is dead when it doesn’t have any native speakers anymore. True, but I think a more vivid way of explaining it would be a language is dead when all its speakers are dead. Recently a new phrase is being used in the context of indigenous language revitalization: the language is “dormant” (and can be reawakened with the help of previous documentation such as linguists’ notes and more recently audio and video recordings). a language is dead when all its speakers are dead. i) idʰa ‘here’ in Pāli etc. preserves the original occlusion reconstructed for Proto-Indo-Iranian, which is reflected in Avestan iδa but lost in Vedic ihá (§57; Wackernagel 1896:250, von Hinüber 2001:179). ii) The Prakrit middle present participle suffix -mina- may be explained as a regular outcome of PIE *-mh₁ne/o- (Klingenschmitt 1975:159ff. ), and is more archaic than the Vedic thematic middle present participle suffix -māna-. iii) There is the view that Proto-Indo-European *r and *l merged in Iranian and in a dialect of Indo-Aryan represented by the R̩gveda, but the distinction is preserved in some other Indo-Aryan dialects (§99; Bechtel 1892:380ff., Deshpande 1979:263ff.). iv) Another example is the preservation of voicing in the cluster /ggʰ/ as in Pāli -jaggʰati ‘laughs,’ which is lost in the corresponding Vedic form, pres.ppl. jákṣat- with voiceless /kṣ/ (§45; Hoffmann 1969=1975:306). Contrary to Sanskrit, Avestan preserves the distinction in voicing, and partly in place as well, so the neutralization [of the clusters of any PIE velar consonant + *s] must have taken place after the divergence of Indo-Aryan from Proto-Indo-Iranian. The merger to /kṣ/ in Sanskrit is different not only from Iranian, but also from later languages of Indo-Aryan itself. Middle Indo-Aryan voiced reflexes ((g)gʰ or (j)jʰ: geminated in medial position) corresponding to Sanskrit kṣ, e.g. Skt. kṣárati ‘flows’: Pāli (pa-)ggʰarati, Pkt. jʰaraï or Skt. kṣāmá- ‘scorched’ : Pāli, AMg. jʰāma-, are claimed to have preserved original voiced clusters from Proto-Indo-Iranian, as in Av.√γžar in -γžārayeiti caus.3sg. (Pischel 1900:§326, Geiger 1994:§56, Emeneau 1966:134, von Hinüber 1986:115, 2001,184f., Masica 1991:173). If that was the case, it follows that the extensive merger to Skt. /kṣ/ does not apply to the Old Indo-Aryan dialects through which those Middle Indo-Aryan languages developed, for a merger is generally considered to be irreversible (§4); but rather, the cluster /kṣ/ belongs just to a dialect of Old Indo-Aryan which had a restriction against sibilant voicing. Another case of an apparently reverted merger is Sanskrit kṣ from PIIr. *ćš < PIE *ḱs as in Skt. kákṣa- m. ‘armpit’ : YAv. kaša- (Hoffmann and Forssman 1996:103), whose /k/ looks as if PIIr. *ć reverted to the original Proto-Indo-European dorsal stop; but since the dorsal pronunciation is irrevocably lost in Proto-Indo-Iranian, the development into Skt. kṣ has to be explained by place dissimilation (§43). Pischel (1900:§318, 319) again argues that the distinction between PIIr. *ćš and *kš is partly preserved in Middle Indo-Aryan reflexes ccʰ and kkʰ (cf. von Hinüber 2001:183). Masato Kobayashi (2004): Historical Phonology of Old Indo-Aryan Consonants. Study of Languages and Cultures of Asia and Africa Monograph Series 42. Research Institute for Languages and Cultures of Asia and Africa, Tokyo University of Foreign Studies. BTW, hinüber means “to the other side”, also “dead”, “broken”; adding the nobility prefix von, literally “from”, is insurpassable. I was not exactly sure of the meaning of hinüber but its use as a name, and then the von in front, seem bizarre at best. -Even then people simply assumed that their forebears in classical times spoke Italian or Spanish or whatever but wrote in Latin, just as they themselves did. Their assumption might have been much closer to the truth. 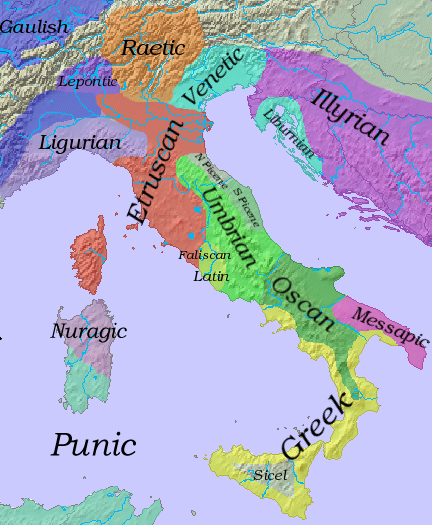 Dante’s forebears probably spoke at home Etruscan, not Tuscan, which makes their relation with Latin even more tenuous. Von Darüber (‘from thereover’) sounds even better. – Too true. I blame Chomsky. Can people please stop criticising Chomsky for something he never did? Documentary linguists don’t criticize Chomsky for this, in fact one of the greatest documentary linguists of all time (Ken Hale) who fits your description of an intrepid linguist tramping around worked within the generative framework. Honestly this annoys me to no end and makes me wonder if peoole actually read what Chomsky says or knows any linguist. There are also a few interesting lexical archaisms, e.g. Pāli nhāru, Skt. snā́van- ‘sinew’ (PIE heteroclitic *snéh₁-u̯r̥/*sn̥h₁-uén-, with the r-allomorph attested in Avestan but not in Vedic or Classical Sanskrit). Less remarkable is the occurrence of archaic traits shared by Vedic and (some of) the Prakrits but not retained in Classical Sanskrit (the list is quite long). While the more complex usages of the ablative absolute in Latin prose emulate a Greek model, the ablative absolute was already used in Latin before. See Antonia Ruppel’s Absolute Constructions in Early Indo-European (Cambridge University Press, 2013), pp. 98ff. @Joon Can people please stop criticising Chomsky for something he never did? I think it is entirely reasonable to read Chomsky’s work and criticise it for proving far less than he claimed http://www.lel.ed.ac.uk/~gpullum/onSyntacticStructures.pdf — Geoff Pullum counts as a linguist, I believe. Or is that not what you mean by “never did”? Perhaps you mean Chomsky never did any fieldwork recording dying languages? I think we should criticise him for that: it makes his claims for Universal Grammar rather hollow, based on impoverished evidence. Honestly this annoys me to no end and makes me wonder if peoole actually read what Chomsky says or knows any linguist. I know Chomsky started a grand tradition of linguists who work exclusively from the comfort of their own armchair/examining only their own intuitions — as if that counts as gathering data. I wonder how many sub-clauses and parenthetical qualifications it takes him to order a cup of coffee? Can people please stop criticising Chomsky for something he never did? The Great God Chomsky created a crew of minions who ran roughshod over virtually every linguistics department in America, driving their enemies before them with whips and torches; I went to Yale for grad work because it was one of the few places where it seemed you could escape being Transformed, but lo, the tentacles reached even there, and I was forced to take a class in Chomskyan Theory before I could get my degree in historical linguistics (I have often compared this to the requirement to pass Marxism-Leninism classes in the Soviet Union no matter what your field of study). You must excuse those of us who resisted the triumphalist tide for our petty resentments and niggling complaints, even if they seem ill-founded to you. I know Chomsky’s written and spoken style is execrably opaque. Perhaps his spoken lecture style. From both personal experience and reading his interview transcripts, I can report that his conversational style is no more opaque than any intellectual’s, including mine. AntC: I fully agree with LH. I am a linguist who attended graduate schools in the US and Canada at a time when Chomsky was taken seriously but had not yet become the reigning idol. I later went into historical phonology and Native Canadian languages (on the spot, not in an armchair), two fields in which training in recent Chomskyan theories is more of a drawback than an asset as far as one’s scholarship is concerned. Socially speaking though, among many linguistics departments this attitude almost always meant that one’s application would be at the bottom of the pile. (Things are changing somewhat, but slowly). I actually heard Chomsky lecture on linguistics a long time ago, and I occasionally view videos where he talks about political matters. Like John Cowan, I find his speaking style to be quite clear, and the transcripts easy to follow. His early works on syntax were also easy on the reader, although I agree that later works became more and more complex and opaque. https://www.researchgate.net/publication/320105418_Jhiri_A_%27Sanskrit-speaking%27_Village_in_Madhya_Pradesh is McCartney’s academic paper on this village, which came out a couple of months ago. As it turns out, I proofread it for publication. The Sanskrit revival work was by https://en.wikipedia.org/wiki/Samskrita_Bharati , and as you’d expect, there’s been political infighting. @joon, all I can say as, Ken Hale as a fieldwork linguist who has any time for Chomsky is the exception, not the rule. Australia is a fieldwork country, and there’s only one linguistics department here that does anything generative. > Nonetheless, simply memorizing some old poems, prayers or even whole holy books isn’t quite the same as attempting to speak the thing pretty much all the time — this demands a considerable understanding of the grammar and considerable practice (with whom?) to begin. Otherwise it would probably result in a curious dialect of the local language sprinkled with Sanskrit words here and there. From McCartney’s academic article (comment still in spam trap): there are some people in the village who speak revived Sanskrit through Samskrita Bharati classes, and their Sanskrit is as you’d expect heavily coloured by Hindi. But it’s a small number of people. The village is suffused with “Speak Sanskrit” slogans, and that is indeed an attempt at sacralisation. Nick: Yes, two or more links puts you in moderation, as does a single link if you update your comment. During America/New_York daylight hours, Hat will liberate you from durance vile fast enough — but note your timestamps on this page. Yes, after approximately 10 pm EST, if you get stuck in moderation you’re SOL until approximately 8 am the next day. The present tense “has” suggests that Ken Hale is still with us, but he has been gone since 2001. He had a genius-level language learning ability. He may have found little snippets of Chomskyan theory useful for describing some features of languages he knew (something possible for many languages), thus keeping on Chomsky’s good side, but he was not what one might consider a disciple of Chomsky. if you haven’t seen the short, low budget ethnographic films I made about Jhiri, then you can find them here http://www.yogascapesinjapan.com/imagining-sanskrit-land-films–articles.html – I’m part way through episode 5. I will probably make a couple more episodes. Time permitting, of course. The UTNE article is an ‘outreach article’ that was written for the specific purpose of engaging with a general audience. Hence, it is more of a travelogue than anything else. As Nick Nicholas points out, he helped publish an article about Jhiri in JSALL, I am deeply indebted to his proofreading – I have a couple of other articles/book chapters that have been published, or are in press, if you would like the details, please contact me. If you would like to help further this research, then I’d be delighted to take donations :-). I’ve only been to 2 out of 16 villages I’ve found mention of. As one commenter above said, there is a place called Ganoda, in Banswada district, SE Rajasthan, which is supposedly full of ‘tribals’ who now speak pure Sanskrit. I would like to continue with this research, but I’m a bit focused on another project for now, http://www.yogascapesinjapan.com/ , which looks obliquely at the Sanskrit language through the lens of global yoga. Hey, Patrick, thanks for commenting — I’m glad you found the post! Good luck with your travels and research; you’re doing great work. There’s a stage beyond dormant, though, when there is no longer a culture for which the language is symbolic. There are no longer any Turkish-speaking Hittites in Anatolia for whose sake the Hittite language might be revived. It’s the difference between mostly dead and all dead (YouTube). There are no longer any Turkish-speaking Hittites in Anatolia for whose sake the Hittite language might be revived. I actually met one on the Internet. Unfortunately he believed that Hittites were ancient Turks and spoke Turkic, so I am afraid he won’t be interested in reviving Hittite. That’s garden-variety Kemalism, I think. Would they? I mean, the language was called Nešili, but they called their country Hatti. So they’d be Hattites, a name of which I thoroughly approve. The original Biblical “Hittites” appear to be Semitic, a Canaanite tribe. Later writers then confused them with the Hatti. When I was in Turkey, the textbook for learning Turkish was called, of all things, Hitit. Apparently the last of the former Anatolians (by then probably Greek-speaking) were driven out by the Seljuks sometime around the 12th century. Nesites (from the city of Neša = Kaneš), if one insists on a Greek suffix. They called themselves the Nešumeneš, and they spoke nišili or nešumnili ‘in Hittite’ — I mean, ‘in Nesite’. Those of the locals who don’t speak Welsh speak English, a language related to Albanian. Gypsy language derives from Sanskrit. What do you mean? What made some Greek speakers in Anatolia Anatolians and others not? Presumably referring to those Greek speakers descended from the pre-Greek inhabitants who spoke Hittite, Hattic, etc., rather than those descended from Greek settlers. The last documented Anatolian language was Pisidian (probably a member of the Luwic clade), which survived till ca. 300 CE. Among the spectacular mountains of the Caucasus dwell the Ossetes, who speak a mysterious and ancient language related to Dutch. Among the picturesque canals and windmills of the Netherlands dwell an ancient people whose little-known dialect is thought to be related to the languages of the Caucasus. This is becoming dangerously similar to the “not strictly untrue” hype that university press offices so love to churn out. I personally despise humanist Latin. Clement VIII revised the hymns of the breviary in the classical style, and the texts pale in comparison to the earlier editions, As it is, I already find truly classical Latin to be much more difficult than medieval Latin, as a general rule, though generally, it’s easier to work your way backwards from medieval Latin and the Latin Fathers to the classical authors. The point is that Latin evolved and was used, if primarily in writing, but those who knew Latin could communicate orally if they needed to do so. There were plenty of people for whom Latin may as well have been a first tongue. @Piotr Gąsiorowski: Vedic isn’t the direct ancestor of Classical Sanskrit either. There were plenty of people for whom Latin may as well have been a first tongue. In Stendhal’s novel Le Rouge et le Noir (the colours refer to the army and the clergy as potential career choices), written in 1830, the young (anti)hero spends time in a seminary. When he first meets the director, the latter asks him: Loquerisne linguam latinam? ‘Do you speak Latin?’ and he replies Ita, Pater Optime ‘Yes, Best Father’, and the conversation (not reported!) continues in Latin. A French friend of mine visited Rome and the Vatican in the sixties and heard priests conversing in Latin on the street. But they no longer did so on a more recent visit. The Vatican regularly publishes in Latin and has a section devoted to creating words for modern things and concepts. The previous pope announced his resignation in Latin. One journalist understood him and got the scoop. Vedic isn’t the direct ancestor of Classical Sanskrit either. Interesting. What is the evidence for that?